Is it too much to ask for a pair of jean shorts that cover both my cheeks? Apparently so, because I shopped around all over creation and couldn't find a pair with proper coverage. I'm not asking for shorts down to my knees, just ones that completely cover my caboose! After my fruitless search, I came to the conclusion that, if I wanted a pair to fit the way I wanted, I'd have to make them. 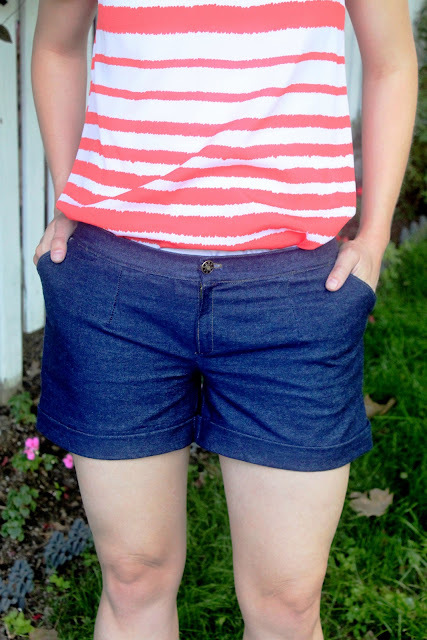 As scary as the thought of making shorts for myself was, I was feeling pretty unstoppable after learning how to make a functioning fly and pockets from the Classic Chinos pattern that I tested for Peek-a-Boo Pattern Shop. I have never been one to make a muslin for any pattern, but I thought if there was ever a time that I needed to start, it would be now since I've never made pants for anyone bigger than a 4T. I used a pair of shorts that fit me well to draft up the muslin, and when I thought I had it right, I dove right in using some denim I scored for dirt cheap at an estate sale. When I had assembled everything, I found that I had somehow made the pants several inches too big, so I had to go back and add front and back darts. I'm not sure if darts are even kosher for jean shorts, but it worked. 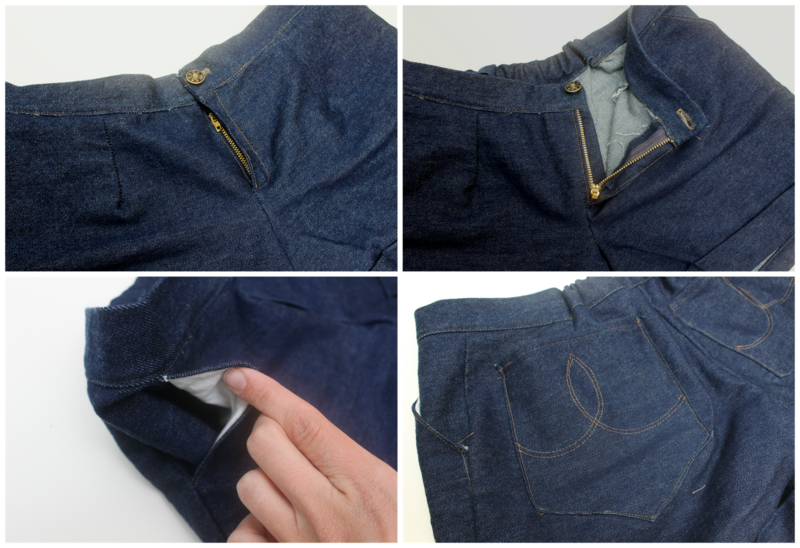 I installed a hammer-on button, working fly, lined pockets, and check out the fancy stitching on those back pockets! I thought, if I was going to go for it and make myself jean shorts, I better go all the way and give them some fancy stitching while I was at it. It makes them look less handmade (and I'm kind of impressed that both sides are even. Whew!) Even after adding darts, I found that the pants were gaping some in the back, so I added a small piece of elastic in the back waistband. I wish I didn't have to add that, but it's really not very noticeable and it gets the job done. I actually sewed a proper cuff on the bottom of the pants, which looks invisible from the outside (i.e. the stitches are hidden by the cuff itself, and they're sewn on the side seams.) If anyone would like a tutorial on how to make nice pant cuffs, let me know! It's a fun trick to learn that gives pants a nice finished look. When I was done, I had a nice pair of jean shorts that cover all the things they're supposed to. I wish I could share a pattern for these, but my pattern is far from perfect. I'd like to make a few more pairs in the future, so if I ever get it right I'll be sure to share :) Until then, I found this great free tutorial and pattern by Owly Baby for Imagine Gnats HERE. Very impressive! I like the darts personally. I've never drafted anything, and your shorts look great. Super cute! They fit you great! Great job. I've pondered making my own shorts, but I'm terrified to wear them, and I don't want to waste time and fabric on something I'm unsure I would wear. Grr. Damn you chicken legs! Some shorts are just too cute not to make though. So cute and so flattering!! Let us know if you master your pattern. I would love to make a pair of these. Great job! I wouldn't have even known they were homemade! Drafting shorts...impressive! I can understand the desire though, inseam lengths are ridiculous. Also, my bottom half is, shall we say, tricky. Ha. But wow, Jen, this is quite inspiring!